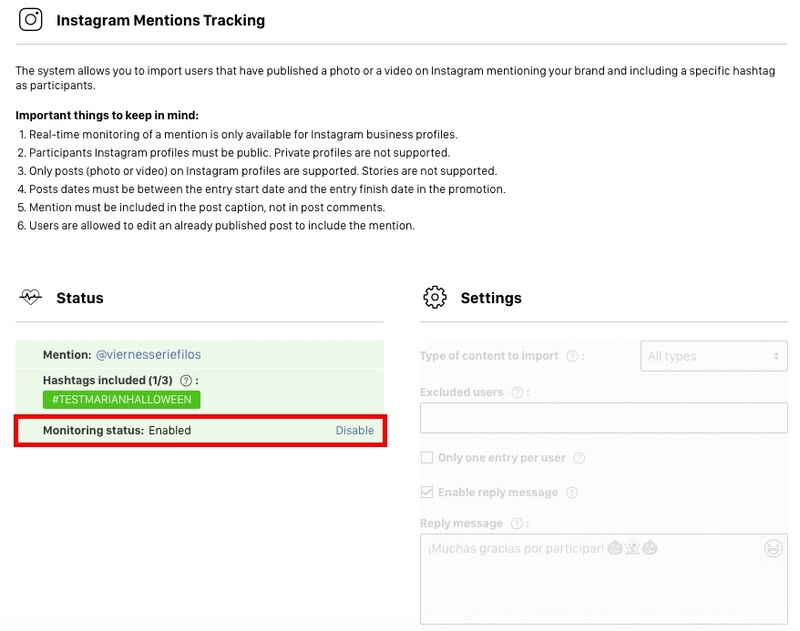 If you have organized a 'Mention + Hashtag Contest' and you notice that in your contest some photo/video posted on Twitter/Instagram by users has not been automatically imported into the gallery, it means that for some reason the Twitter/Instagram API can't return these publications and, therefore, it has not been possible to import them. In this tutorial we explain the 6 main reasons why a photo/video has not been imported automatically. In addition, we explain how the tool to manually add the photos/videos that have not been imported. Make sure that the participant's Twitter or Instagram profile is public and not private. The profile of the user must be public at the moment of publishing the photo/video. It's not possible for the administrator to add them manually either. The integration with Twitter/Instagram must be enabled from the beginning, as in order to import the photos/videos published by the users, these publications must be real-time monitored and imported. The reason is that the Instagram API does not allow retroactive searches. The photos/videos must have been published on Twitter/Instagram within the "Entry Date" configured for the contest. Therefore, if a photo/video has not been imported, make sure that it has been published within the established entry date. It's not possible to import more than one photo or video from one post or tweet (for example, an Instagram gallery). If more than one entry per user is allowed, they should always be posted separately in independent posts or tweets. It's not possible for the administrator to add them manually either. Users are allowed to edit an existing post to add the mention and the hashtag, but the system will only be able to import this post if it was published within the participation dates of the promotion. In the case of Twitter, the photo, videos and texts can take a maximum of 10 minutes to be imported into the contest photo gallery. 1. Access to the promotion's management page and click on "Participants". 3. Then select Twitter or Instagram depending on the participation origin. 4. Obtain the tweet URL or the Instagram post URL that you want to upload and paste it in the corresponding field. 5. Click on "Search" button and you will see the information of the tweet or post. Confirm that you can add it by clicking on "Add" button.